CBDT has recently announced option of securing income tax e-filing account by E-filing Vault. This facility is introduced to secure online e-filing account from possible misuse or fraud. This facility will act as two-factor authentication for your e-filing account. It is a method of confirming a user’s claim identity by using a combination of two different components. Once you activate this facility you will be allowed to access your e-filing account only if you authenticate using both the factors. An example of two-factor authentication is ATM transaction. You will be allowed to withdraw money from ATM only if you provide correct combination of a bank card (something you have) and PIN (something you know). It is a way to apply additional security layer. It is but natural that a lot of sensitive information is available in the income tax e-filing account. A compromise in this information could be dangerous. If you have not secured your Income tax e-filing account, I recommend to follow the procedure given below to apply this security. Step 2 – Go to Profile Settings and click on E-Filing Vault-Higher Security. Prerequisite – Users should have logged-in to e-filing portal through Net-banking at least once to avail this option. Prerequisite – Users need to register Digital Signature Certificate before opting for Login through DSC facility. Prerequisite – Users need to Link Aadhaar to the PAN before opting for this option. 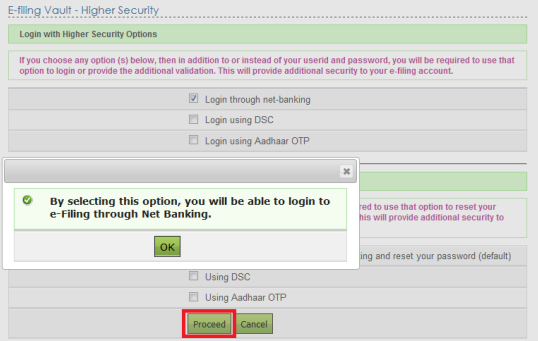 Step-4 – Select the require option to secure your account. Press proceed button. On success, you will be allowed to log in only with the selected options. 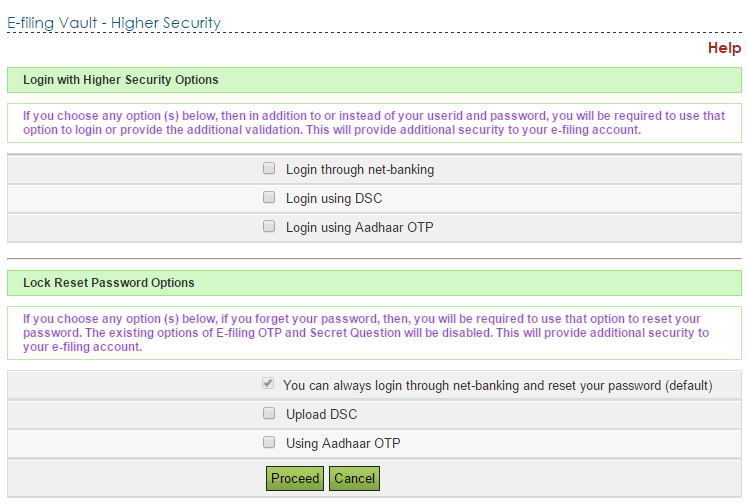 This option allows you to log in through net banking, along with your e-filing user id and password. Once you select this option you will be asked about a confirmation of this selection. Once you press OK button you will be redirected to a confirmation page. Click on confirm button. Success message will be displayed on the screen. Next time when you login to e-filing portal you will be redirected to net banking page. You need to select your bank from the list. 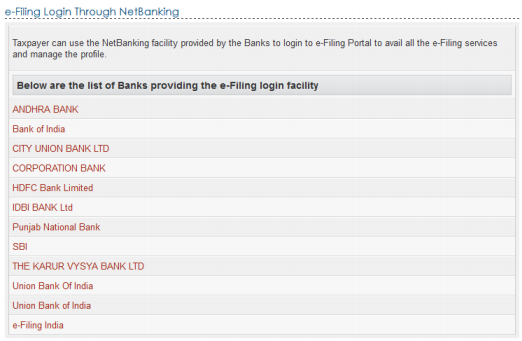 After login to Net Banking account, click on “Login to The e-filing account”. You can deactivate this facility anytime. This option allows you to login using your digital signature, along with your e-filing user id and password. Once you select this option you will be asked about confirmation of this selection. Press OK button. Following confirmation message will appear. Click on confirm button. A Success message will be displayed on the screen. 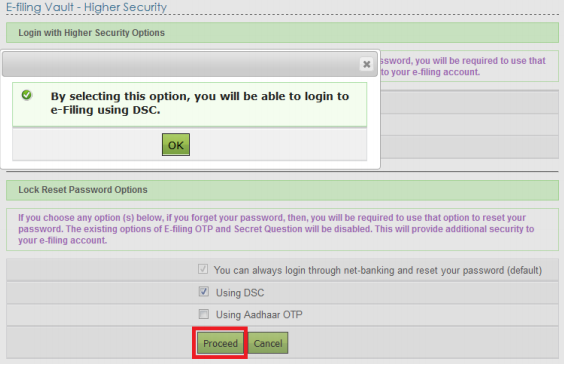 Next time when you log in to e-filing portal you will be redirected to secure login page asking selection of DSC. Upload your digital signature and you will be redirected to e-filing dashboard. If you wish you can deactivate this option anytime. If you select the option of Aadhaar linked OTP, you will be asked to enter OTP in addition to normal username and password on e-filing website. This OTP will be received on your register mobile number during this authentication process. Once you select this option system will ask you to “Generate Aadhaar OTP”. On pressing “Generate Aadhaar OTP” button OTP will be sent to your register mobile number. Enter OTP and press Validate button. Success message is displayed on the screen. Click on “OK” and click “Proceed” button. You will be directed to confirmation page where you need to press “Confirm” button. Next time when you login to e-filing portal you will be redirected to Aadhaar OTP Login page where you need to generate Aadhaar OTP. Once you click Generate Aadhaar OTP button. OTP will be generated and sent to your mobile number. Enter your OTP and press validate button to login to e-filing portal. E-Filing Vault is very good security feature provided by the income tax India. This addition security layer will surely help tax payer to secure their highly sensitive information from hacking or misuse. 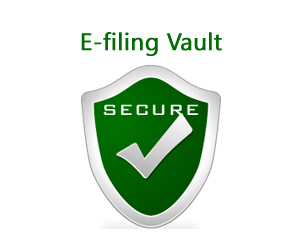 You should secure your e-filing account using E-filing vault. How to Lock Unlock Aadhaar Card Online? « Top Sugar Stocks gives 1000% return in past one year – Should you invest?